Dwolla was part of a hiring and team building conversation with members of the 2018 cohort for the Iowa AgriTech Accelerator. The Iowa AgriTech Accelerator is a 100-day program for startup technology companies in the agriculture industry. Companies participating in the program must travel to Des Moines for programming that includes intense mentoring, holistic education, outreach, networking and presentation opportunities. Each startup receives $40,000 in seed funding from the accelerator in exchange for equity in the company. The 2018 cohort has five startups; Programming began May 29 and will end August 30. This is the second year of the Iowa AgriTech Accelerator, which is led by Executive Director Megan Vollstedt. Vollstedt said as the program progresses, she will invite external speakers to provide additional insight and advice based on specific areas of need. Past conversation topics have included digital marketing, supply chain issues and legal FAQs. 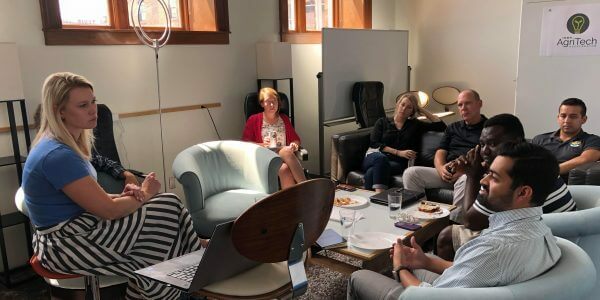 Team building was the focus of a one-hour conversation last month between Dwolla’s Director of Human Resources Jenna Hogan and the 2018 cohort of the Iowa AgriTech Accelerator. Hogan spent an hour answering human resources-related questions and discussing the value of keeping the company, “Vision, mission and core beliefs” at the forefront when it comes to hiring. Vollstedt said startups need to prioritize hiring and know when to hire for sales or more technical roles.